Place an order online. Write down your order number. We accept design requirments either by email or online. Website: Please upload files (high resolution Logo or graphics) on the bottom ot this page. Note: Please use subject as 'Free design, your order number# ', includes your design requirements in email body. * According to customer's requirments, free edits up to three times after 1st proof is sent for approval. Additional flat fee $89 is required if over the limit. * This Free graphic design service is subject to purchasing of these products only, Teardrop banner stands, Feather banner stands, Heavy duty outdoor banner stands, Pop up banner stands, Canopies and tents. * For Retractable banner stands and Retail banner stands, a flat fee $89 professional graphic design service is required, available for purchase online. 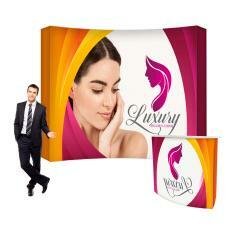 Please send us an email to service@lushbanners.com, a sales representative will assist you within 24 hours. High resolution PDF or JPEG is recommended. Would you like to add some text on this banner? Please keep it short and clear. Do you have some specific colors in mind? Free color match if you have CMYK or Panton color numbers. A professional designed artwork will be provided in PDF format, delivered by email. Usually this process will take less than 24 hours.